Our Queen Elizabeth Hospital is facing shortages of supplies because it owes and cannot pay millions of dollars to multiple suppliers. Former BLP Health Minister Jerome Walcott is all upset and says patient care is being compromised. From what we’ve seen in the past under Walcott’s rule, that’s probably true. Current DLP Health Minister Pornville (Donville) Inniss (photo above) says there’s nothing new here and he’s “not aware that the level of care has been compromised by indebtedness to suppliers”. Inniss is correct that the QEH hasn’t been paying its bills on time for years, but whether we’re running out of cancer treatment or rubber gloves he’s wrong about patient care not being compromised – for it surely is. We wonder if Minister Inniss has been back to inspect the hospital conditions since we alerted him last year that things were so bad that the hospital staff weren’t even cleaning the toilets. Yuk! 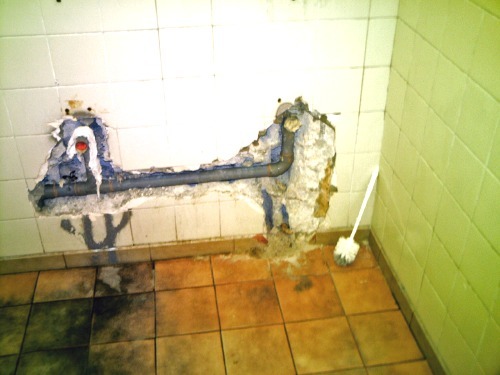 Barbados Queen Elizabeth Hospital Washroom under Health Minister Walcott – “Progress & Quality Of Life” As Defined By The Arthur/Mottley BLP Government. Yes, the QEH has all gone to hell, but Walcott shouldn’t be so self righteous because it was his BLP government that chose to spend hundreds of millions on a failed cricket extravaganza rather than making health care and clean water a priority. We’re out of money, friends. And it seems the only answers our politicians Glorious Leaders can come up with is 1/ Deny the problem exists, and 2/ Borrow more money to stave off disaster. Walcott or Inniss: It doesn’t seem to matter which one is Health Minister because nothing changes. IIf anything the DLP has made an effort to improve the QEH physical plant, while the BLP let it rot. Think of the money we would have had for health care if not for the Crikcket Palace and Gems Hotels that were two bottomless pits for tax dollars. The party is over gentlemen. It’s really over and there’s nothing can be done about it. Ten years from now the current state of the QEH will be remembered fondly. This will not be pretty. Police in de same boat, doan worry! Check this true story that now cross my path. A woman getting harrass/hounded/stalked by a nasty druggie boyfriend. It get so bad, she hiding at a friend hous, in the country, den. The man find out where, and he all outside peeping-in an ting. Well he start to brek-in de house now, so push coming to shove, yuh sight? …gets the Police at the nearest Polica Sta. so SHE,THE FRIEND should call the next-nearest Police Sta. and relate-over the same story all over again. Meanwhile the man brekin in de house all like now so. No, all like now so de girl probably DEAD. coz yuh wasting yuh time! Barbados returns to African conditions! How cud it possibly be any other way?? Barbados is DONE, you hear me? Let them stick them hands in NIS’s cookie jar to pay the suppliers rather than dumping it on Four Seasons and Almond Resorts. It is the end of an era. Hencforth “no money no honey“ NIS funds not going to help unless they are in US$. Foreign exchange is what is needed. Even the Cubans wont take payments in Barbados dollars. but trust me when I tell you I’d just as soon fork out the four thousand dollars to have it done here privately. so I might just as well pay the local price and have it done right here! Incidentally, cataract lens-replacement surgery is now THE most common type of eye surgery being done on a daily basis. Going North to have it done would be about as scaredy-cat as travelling abroad to get a penicillin injection! HUNDREDS of cataract ops go down every week of life, on this lil island..
To blame Dem you have to go back to the bee hive. Blaming one party is one thing over looking what the other did is another. A lot of the blame lies squarely with DEM because Dem are he the hands reeling the power. What else would u have Dem to do when the world faces global economic uncertainties. What else would u have DEM do when we ain’t oil rich and naturally resourceful. How are we going to generate enough economic activity o increase foreign exchange outside of our number one FE earner? What other stabilization controls outside the ones DEM are introducing that will keep the economy from further sinking. The Bees in the hive would have been aware of what was coming and their track record is clear for all to see. At the end of the day DEM-BEEs does do foolishness without a single thought for all others around them. Now the middle class will go back to borderline poverty if not plunged into it already and the rich will strive, prosper and look upon their suffering contrymen with either pity, remorse or tidings of joy for finally widening the gap even further between us and them. Surely the plunder by DEM Bees was for purpose because I doubt if they really feeling this crisis. I got news fuh U.. If they can’t find money to pay suppliers where are they going to find money to construct a new hospital? According to the Minister and his sidekick CEO, the QEH is meeting its obligations to its creditors. Nothing unusual or untoward is happening when its comes to cash flow to meet its current obligations. Do you know if the scenario is different to that which is painted by the spin doctors? No private investors will consider lending money for construction of a public hospital. Not even under a BOLT financing arrangement in these economically perilous times. Funding for such a project would have to come from the IADB or similar lending institution. This would require serious structural adjustment to the local economy and the imposition of user charges right across the spectrum of hospital care. Don’ be fool by the politicians. Elections are just around the corner. killing my mother in 2009 due to their lack of sanitation and doctors that feel they are god and do not have to listen to family as to what the patient requires. They infected her and then failed to treat her!. I wrote many letters to the hospital, the hospital board, the nurses monitoring bodies, and physcians monitoring body but no way did anything let alone respond NO one cares and your life is worth NOTHING!!!!!! !